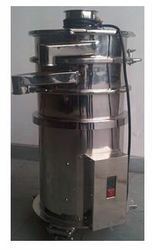 Our product range includes a wide range of vibro sifter 36", vibro sifter 48", vaccumerated sifter 48", vaccumerated sifter 30", lab sifter 20" and r & d model sifter. With firm commitment to quality, we manufacture, supply and export a comprehensive range of Vibro Sifter. These products are designed with the principle of vibro motor which ensures hassle free functioning. It is the duty of our team members to design these products with precision and perfection so they utilize only optimum quality components and metals. We are one of the most promising manufacturers, suppliers and exporters of an extensive array of Lab Sifters. These products are engineered by our team of experienced professionals, who possess rich experience in this domain. Furthermore, in order to ensure hassle free functioning of these sifters, we test the same before shipping the products on strict guidelines. 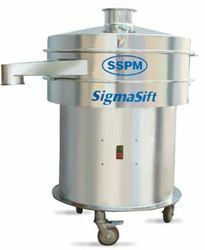 SSPM- “Sigma Sift” is designed on Vacuum Rated Concept; you can use this sifter as an inline process through Pneumatic Conveying System (Vacuum Transfer System Process) which is also suitable for manual material charging system as well. Single Deck Vibro Sifter 48"
Sifting is a Pre-process & is crucial for pharmaceutical formulation to ensure the final quality of finish product. 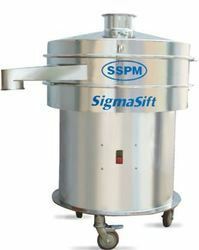 SSPM- “Sigma Sift” meets cGMP requirement of the pharmaceutical, food, chemical and other allied industries. SSPM- “SigmaSift” having a specially designed “vibro motor” that is fitted eccentric and designed as per required centrifugal force. Single Deck Vibro Sifter 36"
Single Deck Vibro Sifter 30""
Single Deck Vibro Sifter 20"
Single Deck Vibro Sifter 12"
cGMP model with all contact parts SS 316with Mirror finish and Non-Contact parts with SS 304 in Matt finish. Main structure of the machine is made up of heavy duty MS and covered with SS 304. Dust free design with low noise level. Trolley based design with PU castor wheels for the ease of movement. All gaskets and seals are food grade certified. Easy dismantling, cleaning & assembling through quick opening clamps. All the electrical hardware and brought out components: make of L &T/Siemens /BCH/ C&S or any other standard make. 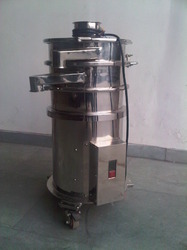 Output will be approximate 10 to 20 kg/hour and it’s depending on size mesh size, material density & its characteristics. The main structure of the machine is made up of heavy duty MS and covered with SS 304. Output will be approximate 20 to 50 kg/hour and it’s depending on size mesh size, material density & its characteristics. 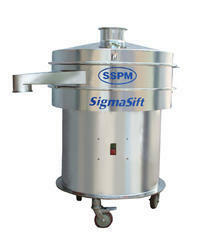 Looking for VIBRO SIFTER SINGLE DECK ?